You’re back – great – anything strike you as still relevant today? Is Religion assisting in solving the world’s problems? The market is rational; should we model China’s economic route to stability? Educated westerners would never shoot big game with crossbows for fun, would they? Governors would not ‘take over’ a school to radicalise its children? We can bomb those we fight into submission? Illegal immigration arises from the UK having too generous a welfare state? Let’s have a quick look at the scene in Education in August 2015. Secretary of State for Education, Nicky Morgan has suggested to teachers that they could ease their workload by not answering emails after 5pm. And loads of other garbage like that. Such as ‘Teachers waste too much time marking and preparing lessons’. Her minister for school reform, Nick Gibb insists that text books are essential for better learning. Excellent, except of course this government has changed every secondary and Sixth Form subject and method of examining at the same time; where’s the benefit in suggesting there is no better way to service the modern motor car, yet suggestibg purchasing a Haynes’ guide for the Austin Allegro. It gets worse; the England cricket team has just retained the Ashes;l well done them, though I wonder how many attended English state schools? If only private schools would share more of their DNA…as if that’s the answer, which it is not. The way to solve this country’s literacy problem is to commit that every 8 year old will be enrolled to their local library and be inspired by celebrity role models/authors like David Walliams to show Europe the way. Why is that hoping to work, except for Walliams, whose children’s fiction books are printed and ready to fly off the shelves. At almost every level in Education, the next steps don’t start from where the country is now, because rather like ISIS in Syria, those in charge are destroying wholescale the infrastructure that previously has secured egalitarian access to services and solutions. The trouble is, this destruction of structures follows the previous regime for 20 years which had imposed a totalitarian approach to learning for so long that many adults entering the profession in 2015 are content to subscribe themselves to the ‘Do as you were done by’ approach, because to disobey means to attract the wrath of management and opprobrium of the inspectorate. emphasises that Asian children do so much better at school than English and the BBC runs a faux experiment that seems to prove Chinese ways of working are more effective in a state comprehensive in Hampshire. Child suicide is not just a real concern in South Korea; Japan sees ghastly numbers choose this each September when school restarts. So when did the Mumbo-Jumbo takeover? It was not the imposition of the National Curriculum, or even the testing of the end of key stage outcomes that started the rot, back in the ’90s. It was the publication of school data as part of a league table culture that began the slow and insidious movement of ‘bad education’ within the key stage. The arrival of national literacy and numeracy hours to ‘focus’ children and teachers on the importance of these 2 subjects, and the movement of that focus up through KS3 and KS4 seriously damaged teaching pedagogies to the core. Suddenly everyone within a key stage had to be assigned a target grade for the end of the key stage; learning had become linear, and government expected every child to move up the grades (by 2) as cars do through the gears. But children are not machines, and cognitive development happens in ‘spurts’; worse still children born later in the year were expected to make as much progress as the oldest. All are forced to start school in the September after they are 4, even though there is no educational evidence that starting education as a cohort is better than when children are ready via drip feed. Many articles written this week highlight that endless assessment from the start of secondary school, the requirement that every child be seen to make progress every 20 minutes in lessons, coupled with the obligatory target setting has removed for most children ‘joy’ during their school days. ‘Furthermore, girls in England came bottom in terms of happiness with body confidence, self-esteem and appearance. 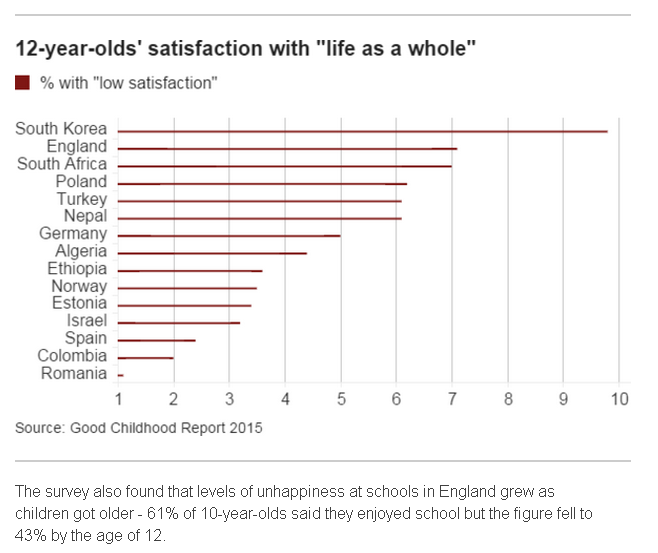 On the whole, children in England have low levels of satisfaction with four major aspects of life – relationship with teachers, their body, the way they look and their self-confidence’. Marc Smith, Huffington Post. Children of all ages are consistently confronted with the hypocrisy of the adult country in which they live, no more obviously than Ashley Madigan website encouraging from the advertising hoardings that ‘adultery’ works. Not I suspect what is meant by the concept ‘Sharing DNA’. How can we encourage a better understanding of morality and tolerance of others when the core subject that delivers same, RS is not given any status at all in the EBacc for state schools at end of GCSE? What amazes me as that in terms of curricular and examination balance, we had actually got it about right some 10 years ago, but the incessant focus on league tables for individual schools, coupled with unprecedented press interest made it inevitable that leadership, management and teaching in schools started ‘gaming’ subject choice or ‘cheating’ the assessments, both in course work and their successor controlled assessments on a grand scale. Successive governments have reduced the role of local authorities to a shadow of their former selves; but to advocate as the Conservatives do now that every secondary school should leave local authority control, become an Academy and report to the DfE directly shows extraordinary faith in a fascist approach for which there is no evidence of success. There was a time when both the Depart of/for Education and Her Majesties Inspectorate had a strong reputation for being wise and independent of the politicians and parliament, thus ensuring that change was managed with care and consideration. Writing at the time of the GCSEs publication last Thursday DfE replied to a Daily Telegraph article that there is no need for drastic change, as the system is evolving. “We have radically overhauled GCSEs to ensure each one plays a valuable role as part of a broad and balanced curriculum that equips young people with the skills and knowledge they need to realise their potential,” a spokesman says. So for most then, this radical overhaul by DfE is at the very expense of the ‘broad and balanced’ curriculum they suggest they are promoting. What price a creative industry, if the only ‘creation’ is in passing exams. Where are the artists, actors, musicians and sports stars in the state sector going to come from if the only way they are valued is through participation in national testing and making the grafe? DfE are now introducing a new measure to show how well secondary schools are doing; it’s known as Progress 8, and guess what, it identifies that children should study 8 subjects at GCSE, with double value being given for following Maths and English. Include English Lit, and that double counts as well. By the time you have added in 3 sciences, an MFL and either Geog or History, you have your 8, so you can see why schools are not going out of their way to promote subjects 9, 10 and 11. After all there exists no bonus for schools in doing that, so good bye to real breadth after all. It will not surprise you, dear reader (if you have stayed with me that is), that the government continues to state that it wishes to give all of its schools the advantages that independents like Claires Court enjoy, ones that research makes quite clear convey huge advantage to those we educate. Our success is not built on privilege or better DNA. Here’s my Mumbo-Jumbo-free 6 of the best list of what is needed. Engage parents as partners and mean it; ensure the day is short enough so parents can enjoy part-time school when the children are young, but long enough so there exists the option of a one-stop shop for parents who work, and children who need the safety of school to get their homework done or rehearse or play can do so. Extending hours works, but not as a mandatory requirement. Develop a teaching profession that is valued for its expertise in providing for all an inclusive and nourishing education. Lose immediately any notion that bonus-pay works in education, and use such funds to better promote in-service training and research. Play the long game, don’t value oxymoron ‘fixes’. Technology is not the answer, ever, to making school better. Investment is needed of course, in equipment, resources and staffing. There’s no such thing as a magic bullet; so don’t waste time looking for it. But we can agree what works, so once that’s sorted, stick by the choice for all. Keep phones off; children do not need to be connected all of the time and nor do adults. Successful social interaction between people in schools gives rise to the greatest successes. Teachers need time in school to plan, reflect and share best practice. Children learn to succeed through challenge and failure, not making progress every 20 minutes. As Singapore Education has found, don’t let children fall behind, and reduce curriculum content so there’s time to ensure they can’t. Don’t make work harder until all of an age can meet the challenge, stretch don’t break, and use your more able to assist those who learn less readily. Don’t let headteachers and leadership leave the classroom too easily; the profession is called Teaching after all. The classroom has looked like the classroom for millennia. That’s not a sign of a thing that’s bad, but actually indicative of a successful space that has stood the test of time. Teachers can teach, but must give time for learning to happen, of skills as well as facts, and for the acquiring of attributes, such as leadership, service, collaboration and interest in research. Teachers must also be diverse in what they do; of course be lead specialists in subject disciplines, but be willing to graze more generally to support the co-curricular and to improve themselves as practitioners for social improvement. Thank you very much for such good critique and making sure that teaching good …..with guidelines are the best way forward. I will always treasure my trime at CC!! !